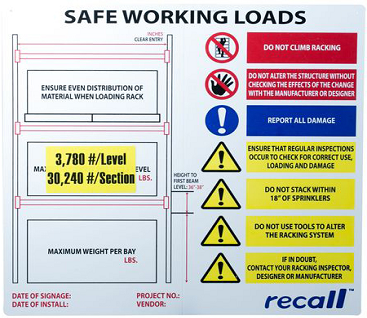 Rack Loading Signs promote and facilitate a safe warehouse environment. The Kennedy Group’s Rack Loading Signs can be customized to communicate vital racking and shelving information, including OSHA safety guidelines, load limits, and inspection information, as well as identification labels for rack and shelving contents. Designed with two information panels, a Rack Loading Sign’s first panel, on the left side of the sign, includes safety, load capacity, storage, and handling procedure information. The second panel, on the right side of the sign, with our proprietary Hold and Release® technology, allows for customized, easily replaced labels and identification markers to identify storage content. Easy reconfiguration and customization of labels and identification markers. OSHA rack and shelving structural safety and storage guidelines. Compliance with multiple rack and shelving manufacturers’ specifications. Maximum load safety warnings on all racks and shelves.